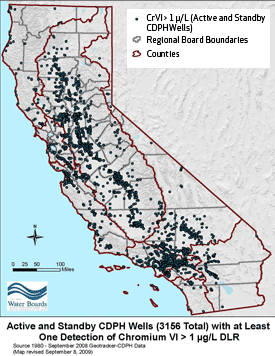 On April 15, 2014, the California Department of Public Health (DPH) released the final hexavalent chromium drinking water standard of 10 parts per billion (ppb). In addition to being 10 years late, the standard is 500 times higher than the level that State scientists have determined would not result in significant public health problems. In addition, since the vast majority of contaminated water sources have less than 10 ppb, only 15% (or less) will receive treatment. That means that 85% of the contaminated sources will not be treated and potentially millions of Californians will continue to be exposed to unsafe levels of this carcinogen. This is a significant point as DPH ‘s decision was primarily based on the costs of water treatment, despite the State’s health related analysis. Because the public would bear the costs of potential illness, while polluters would not be held accountable, Clean Water Action pushed for a more health protective drinking water standard. While disappointed with the final regulation, we were, with our members’ support, able to prevent DPH from proposing an even weaker standard. We also worked with the Governor’s office to move the drinking water program to the State Water Resources Control Board (scheduled for later this year), where it will be more integrated with other water protection programs and funding sources. This move provides the opportunity to explore how we can best reform the ways we establish drinking water regulations in order to achieve the best results. Where does hexavalent chromium come from? What are the health effects of hexavalent chromium? How are drinking water standards established? What is California’s public health goal for hexavalent chromium? The movie Erin Brockovich alerted the public to the great suffering the little town of Hinkley experienced due to hexavalent chromium in their drinking water. Today, Hinkley is little more than a ghost town thanks to continued water contamination, health concerns, and plummeting property values. While the levels in most other impacted communities are much lower than Hinkley’s, hexavalent chromium has been detected in 2475 California drinking water sources. These sources are spread throughout 51 out of 58 counties. In order to protect public health, the California Legislature passed SB 351 (Ortiz) in 2001, requiring the development of a state drinking water standard for hexavalent chromium by January 2004. Despite this legal deadline, it took an additional 10 years to finalize the regulation. Chromium occurs in the environment largely in two forms: trivalent chromium (chromium 3), which is an essential human nutrient, and hexavalent chromium (chromium 6), which is the most toxic form of the element. Currently, chromium is regulated in drinking water as total chromium and the California drinking water standard of 50 parts per billion measures the amount of both toxic (hexavalent) and non- or less-toxic (trivalent) chromium in the water. Basing the standard on the combined levels of both types of chromium does not adequately protect public health because hexavalent chromium is more toxic at much lower levels than the other form. A combined standard leaves the public vulnerable to health effects from hexavalent chromium. In addition to natural sources, hexavalent chromium enters drinking water sources through discharges of dye and paint pigments, wood preservatives, chrome plating wastes, and leaching from hazardous waste sites. Not surprisingly, communities near chromium waste disposal sites or chromium manufacturing and processing plants are at particular risk of exposure. Probably the most impacted people are workers exposed on the job. Hexavalent chromium is a carcinogen and a reproductive toxicant for both males and females. As a result, it was added to California's Proposition 65 list of toxic substances (pdf) in December 2008. Exposure to hexavalent chromium occurs through breathing, ingestion, and contact with the skin. Although most of the known health impacts are related to inhalation, there is now strong data linking ingestion of hexavalent chromium, such as through drinking water, to severe health effects. In addition to cancer and reproductive harm, short and long-term exposures can lead to eye and respiratory irritation, asthma attacks, nasal ulcers, dermal burns, anemia, acute gastroenteritis, vertigo, gastrointestinal hemorrhage, convulsions, ulcers, and damage or failure of the liver and kidneys. A drinking water standard, also known as a maximum contaminant level or MCL, is an enforceable level for a contaminant in the water, which cannot be legally exceeded by a public drinking water provider. It is based on three things: health impacts, technical feasibility to detect and treat it, and the cost of the water treatment. Both the federal government and the state can establish legally enforceable drinking water standards for contaminants of concern. In California, the establishment of drinking water standards is a two-pronged process. First Cal EPA's Office of Environmental Health Hazard Assessment (OEHHA) does a scientific analysis to establish the level in drinking water at which no significant public health effects would be expected. Based on these findings, OEHHA establishes a Public Health Goal, or PHG. Then the Department of Public Health sets a drinking water standard as close to the PHG as possible - but also based on technical and cost considerations. Note: Drinking water standards pertain to public water systems where the water is provided by a local government agency or private company. They do not pertain to private wells. Testing private well water and any necessary treatment is the responsibility of the well owner. What is California’s public health goal for hexavalent chromium and why is the drinking water standard so much higher? In July 2011, OEHHA established the PHG for hexavalent chromium at .02 ppb. This is based on the potential effects on the entire population, including vulnerable populations such as children, pregnant women, and the elderly. By law, DPH must set the drinking water standard as close to the PHG as is technically and economically feasible. That means that it can be above the PHG or level at which no significant health impacts are expected, but must still prioritize public health. Clean Water Action is committed to seeking the most protective standards possible. We must also work to ensure that those communities without the tax or population base to afford the necessary water infrastructure, have access to the resources they need to comply with those standards. That is why we are working with the State Water Resources Control Board, local communities, the Governor’s office, and in the state legislature to focus attention on how to equitably funnel necessary funding and technical resources, particularly to disadvantaged communities, identify the most efficient and cost effective water treatment technologies to address multiple contaminants, and to protect both our surface and underground drinking water sources from future pollution.